Photography is all about light, but understanding how to approach lighting for portraits can be intimidating. While there is a lot to learn, these lighting concepts are very easy to grasp once you start putting them into practice. 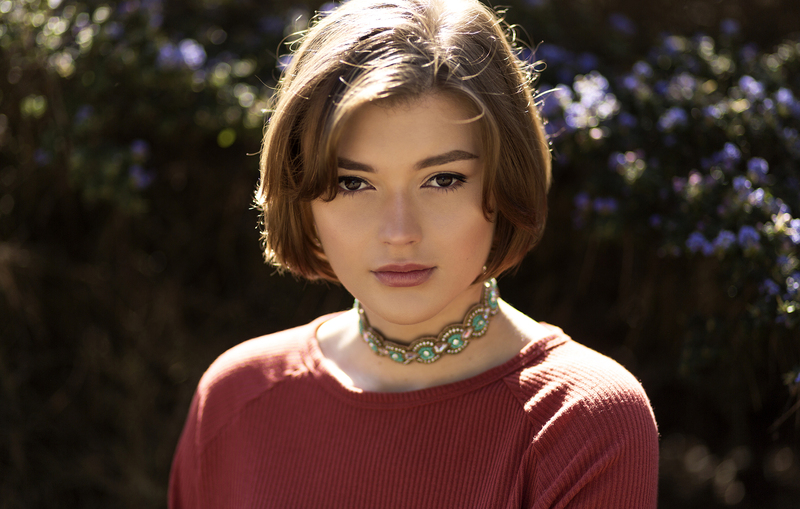 The aim of this article is help you choose where you want to get started with natural light portraits. The first place to start with portraiture is to decide what type of portraits you want to take. The lighting you choose will play a large part in how viewers interpret a portrait. For example, a room with white walls and a lot of light bouncing around will have a completely different feel than a dimly lit room with lots of shadows. When shooting outdoors, a bright sunny day will communicate a totally different feel than that of an overcast and cloudy day. You can work with your subject on what kind of emotions you want to portray so that their expression fits the mood of the portrait. The creative direction you choose is up to you and if you have trouble choosing, then following your subject's lead is the way to go. For example, if a female portrait subject chooses to wear a light-colored, lace dress, then I would choose soft and romantic light to match the wardrobe. Alternatively, for male subjects I will often choose a harder light source with more contrast. In general, male subjects can look great with edgier lighting while that approach can sometimes be unflattering for female subjects. 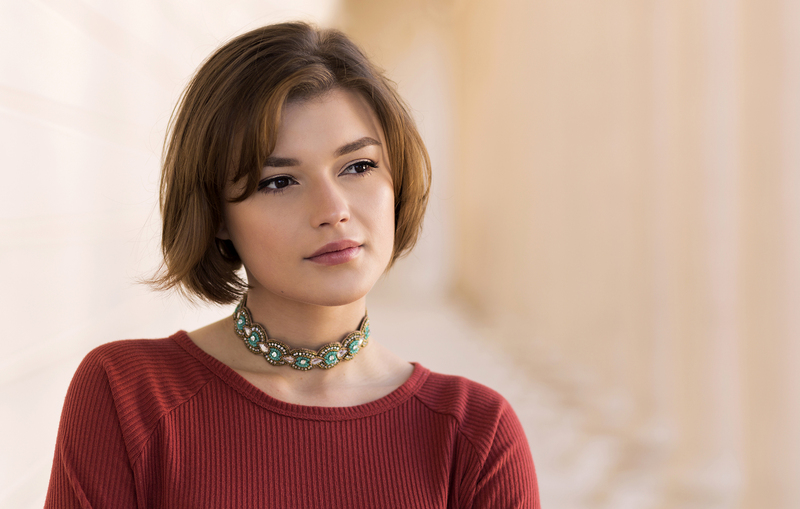 The best time of day for portraits is usually early in the morning and late in the afternoon but with a few tools, you can create striking portraits any time of the day. In general, it's best to avoid the very middle of the day for shooting portraits if you can help it. The direct overhead angle of the sun creates unflattering shadows on the face beneath the nose, chin and brow bone. 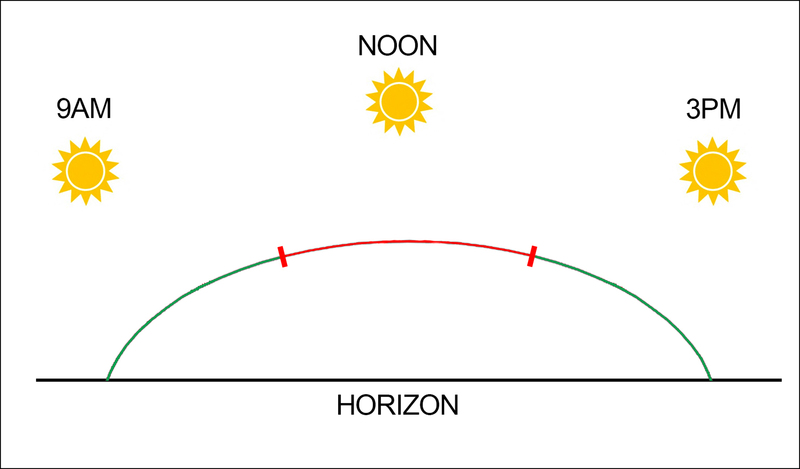 As the sun travels across the sky, the angle of sunlight is easiest to work with at the beginning and end of the arc. In the morning and later in the afternoon, the lower angle of light creates softer shadows and less contrast between shadows and highlights. That brings me to dynamic range. Dynamic range refers to the difference between the darkest and the lightest parts of an image — in other words, the range between the brightest highlight and the darkest shadow. This also plays a role in how much contrast shift is present between your subject and the background. In low light conditions dynamic range is quite small, while on bright and sunny days, that range is much higher. If light is too low then the dynamic range can be flat and unappealing. When sunlight is too bright, the dynamic range can be too extreme and result in images that have too much contrast. I prefer to shoot portraits before 11am and after 4pm whenever possible. Later on we will discuss solutions for how to work with harsh midday light when you have no other choice and how to increase and reduce dynamic range as needed. The much discussed "Golden Hour" is a popular time of day to take portraits as the increased dynamic range makes for better scenes and backgrounds. 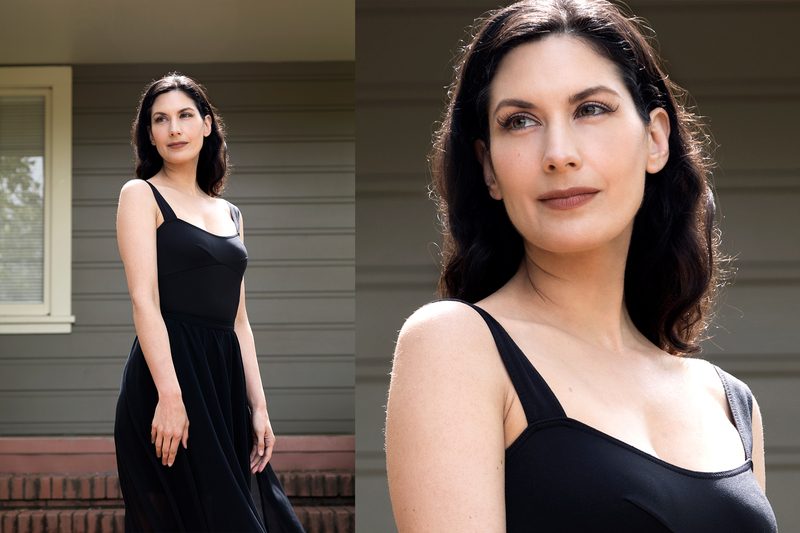 This time period is actually more than an hour and is a wonderful time of day for natural light portraits. Occurring both in the early morning and the late afternoon, the warmer temperature of sunlight creates flattering skin tones and a very warm and inviting feeling overall. Also, the lower angle of the sun during Golden Hour allows for you to pose your subject right in full sunlight and the resulting shadows are softer and more flattering. In the example below, the subject was photographed in a patch of light right around 10am, before the angle was too overhead to be unflattering. 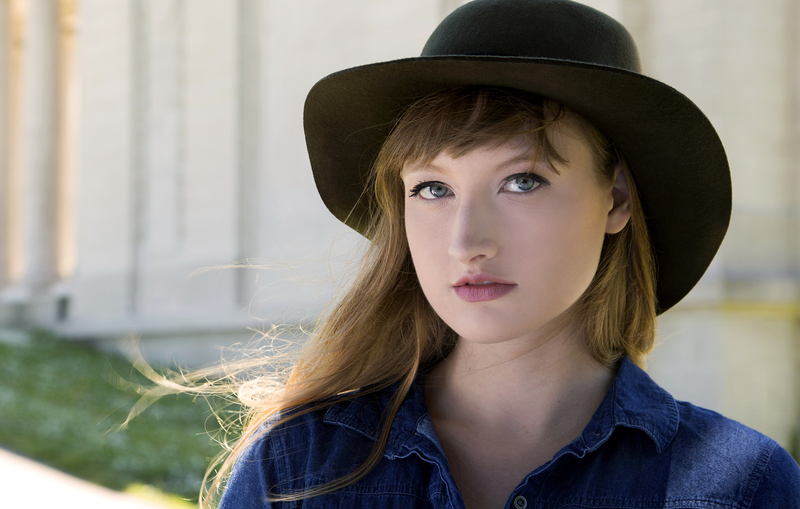 When getting started with portraits, shooting outdoors is a great place to begin. Sunlight can be easily shaped and manipulated to get the results you are after and the unpredictability of working in the elements will build your problem-solving skills. For example, when you plan for a photo session and it's a very cloudy day, you will get better at shooting in flattering lighting conditions. The very next day the opposite could happen and then you could have more sunlight than you need. Shooting outdoors also makes it easy to get started as you can find someone close-by like a relative or neighbor and use your backyard or a local park to practice. Indoor lighting conditions can also be beautiful for portraits. I especially like to use window light, as the glass acts as a natural diffuser for soft and flattering sunlight. I use windows like they are large softboxes and move my subjects closer to and further from the window as needed. Where you place your subject in relation to the window will affect the image a lot. The closer your subject is to the window, the brighter the light will be but the shadows will have softer edges. As you move your subject away, the shadows will become more intense and highlights will become less bright. When working with natural light, how you pose your subject in relation to where the sun is located in the sky will greatly affect the overall look of your portraits. Posing your subject "with the sun" means that you are always aware of the direction of sunlight and from there it's easier to manipulate the light to get the results you are after. Backlighting is a popular technique with natural light, as the results can be very striking. When you are shooting closer to the middle of the day and the sun starts to get too high in the sky, you can place the sun behind your subject for a dramatic backlit look. In the example below, the subject was positioned with the late morning sun at her back. I turned her slightly towards the light to illuminate her shoulders and allow light to wrap gently onto the face. I like to also use flat reflectors with this technique to make sure there is enough light on the subject's face. The backlit look can be very striking but sometimes there isn't enough light bouncing up from the ground and this leaves the subject's face looking too dark. Adding a white reflector to bounce light up into the face can help balance the exposure and ensure that the subject's eyes and face are properly exposed. 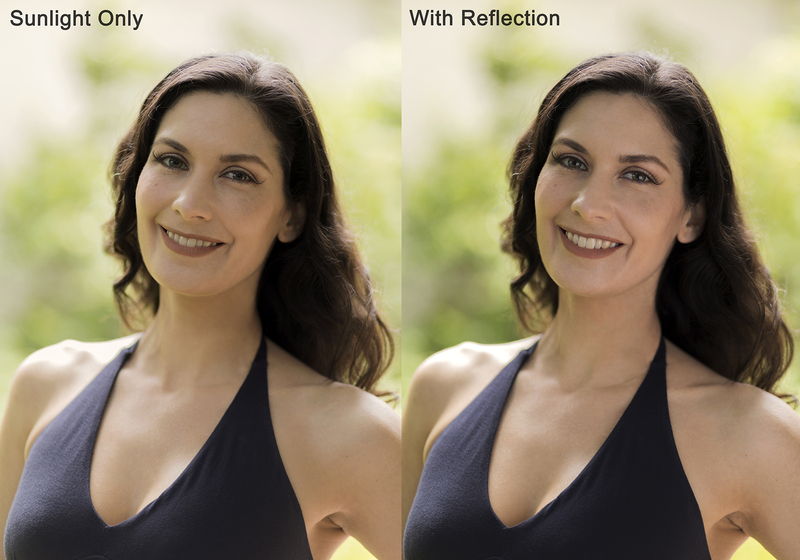 Reflectors are also helpful for equalizing background intensity with the light on your subject. For example, in the portraits below, the subject was photographed in the shade, while the background was in full sunlight. This resulted in the dynamic range being off and a background that was too bright in comparison with the light on the subject. Adding a white reflector to one side of the subject's face in the portrait on the right resulted in more light on the face and less contrast shift between the subject and the background. More information is recorded in the highlights and the exposure is more balanced overall. Comparing the eyes more closely, you can see that the additional light from the reflector also helped the camera capture more detail for sharper focus and added an attractive catch light. Catch lights are a reflection of light sources in your subject's eyes. In the example on the left you can see the area's natural light reflected while the shot on the right also shows the additional white reflector. 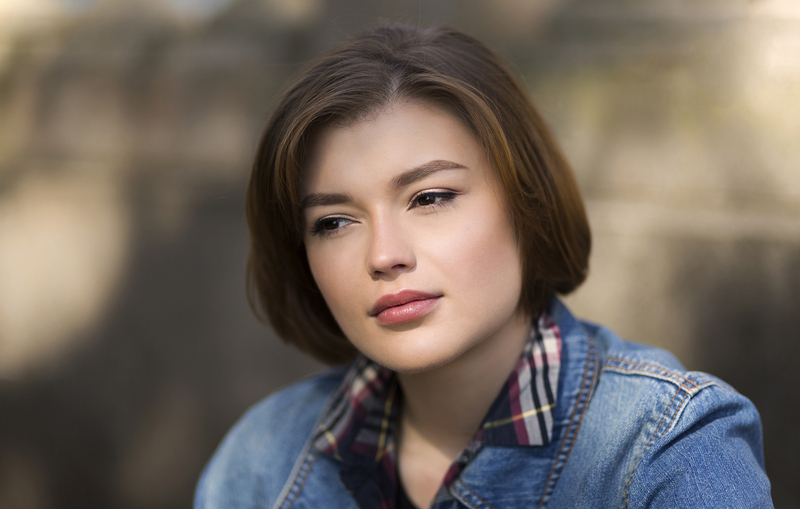 Without a catch light, a portrait subject's eyes can have a flat look and this is sometimes referred to as "dead eyes." Using a reflector is one way to ensure that this phenomenon doesn't occur. 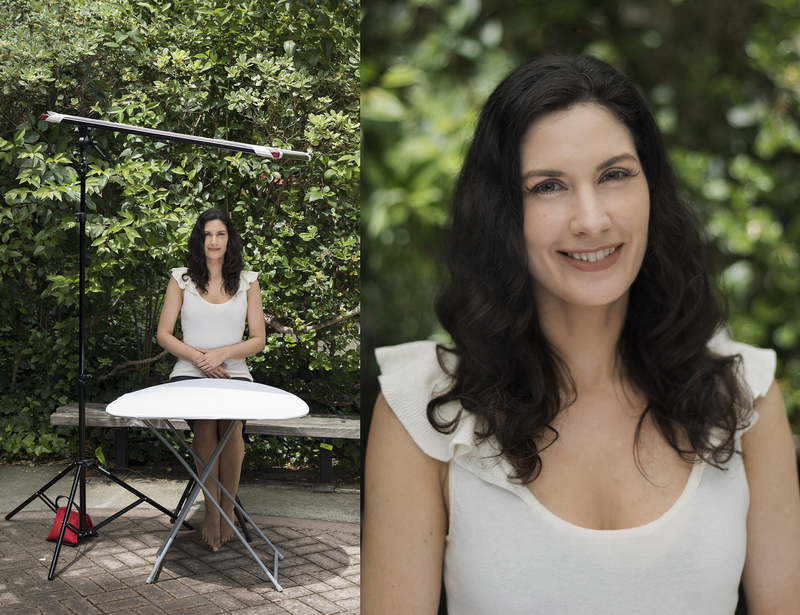 Open shade can be great for shooting portraits as it offers an area of even light to work with. Away from direct light, you can focus on posing and composition without having to worry too much about the light on your subject's face. Look for large leafy trees and buildings with areas of shade that stretch out. The deeper you go into the shade, the less light you will have to work with. The closer you are to the edge of the shade, the brighter the light will be. I like to use this to my advantage and I place my subjects further or closer to the edge of the shade, depending on the look I am going for. In the example below, the subject was placed inside a patch of shade with her back to a sunlit area. You can see beautiful highlights where light from the bright area outside of the shade bounces gently onto the subject's shoulders and cheeks. Inside areas of open shade, reflectors work really well as a source of fill light. If you are finding that your subject's skin tones are looking a little muddy, adding a white or matte silver reflector can effectively bounce more light onto the face and fill shadow areas. While it’s best to avoid the middle of the day when shooting natural light portraits, sometimes it can't be helped. When this happens, I like to use diffusion panels. 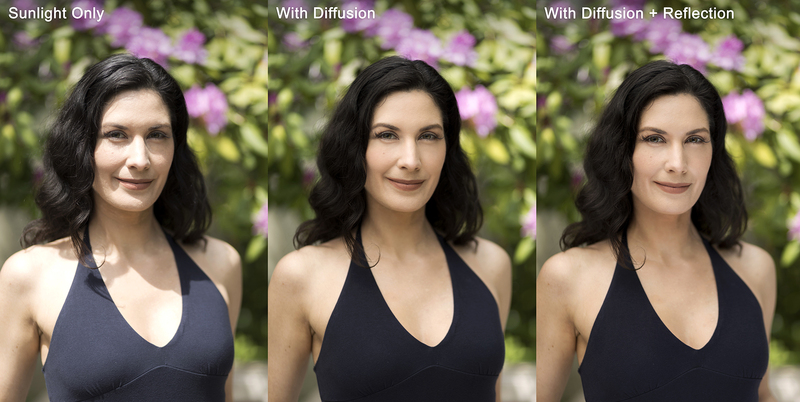 Diffusion material reduces the amount of light falling onto your subject which in turn reduces contrast and dynamic range. This is different than working in shade as the semi-translucent material filters some light through. This diffused light is soft while also being bright, depending on the time of day and how intense the sunlight is. In the example below, a diffusion panel was set up above the subject to soften the harsh midday sunlight and a white reflector was placed below the subject to bounce light back up into the face. Without the reflector, the diffused overhead light can still be a bit too strong in the middle of the day. In the comparison example below you can see the same portrait photographed in full sun as well as with diffusion and diffusion + reflection. 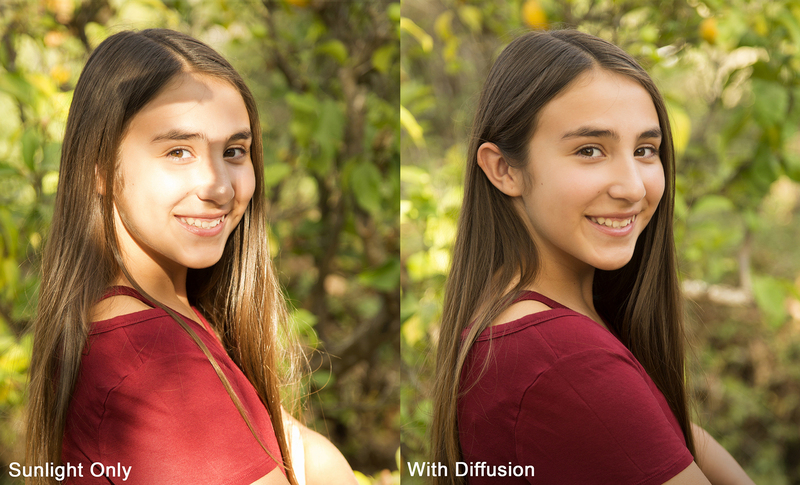 Depending on how bright the light is, you can adjust the position of your diffusion and reflector as needed. Diffusion panels also help when you are working in areas of open shade. Under a tree, the shade can be dappled and patchy and using a diffusion panel will remove the unwanted highlights, while still letting beautiful light through to fall onto your subject's face. "Bokeh" is a Japanese word and in photography it refers to a lovely blurring effect, usually in the background of a photo. This technique works wonderfully for portraits and can be very fun to experiment with. A successful bokeh portrait achieves this blurred effect without sacrificing sharp focus for the subject. 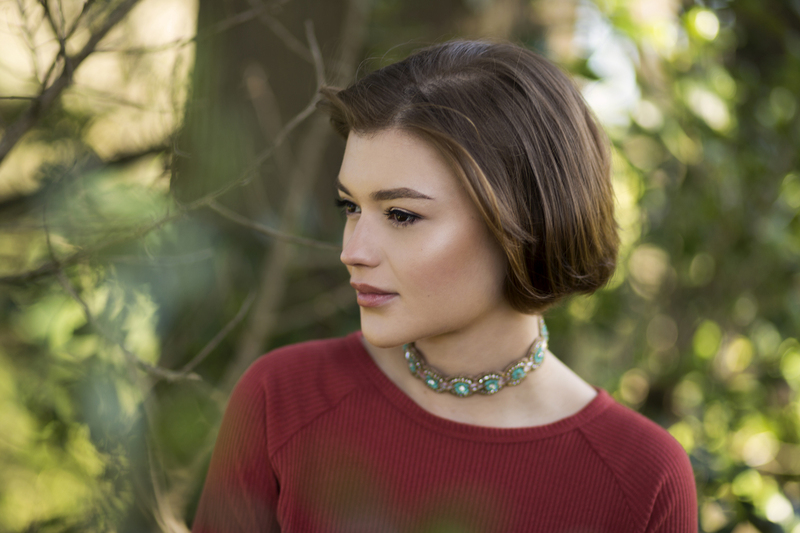 To create beautiful bokeh portraits, choosing the right lens is key. Bokeh works by using a very shallow depth-of-field, so you need to choose a lens that goes wide open to apertures like f/2, f/1.8 and f/1.4. It also helps to create some distance between your subject and the background to allow it to fall out of focus. The closer you stand to your subject, the smaller your area of focus is, so in order to ensure that your subject's face is in sharp focus (and especially the eyes) it helps to stand back a little from your subject and use a longer lens. My favorite is the Canon EF 85mm f/1.4 telephoto because the Image Stabilization also helps with nailing tack-sharp focus in the eyes. Bokeh techniques work especially well with natural backgrounds. I like to choose areas that include flowers to add a splash of color. In the example below, the portrait on the left was taken at f/5.6. While the flowers are slightly out of focus, the background is busy and distracting. In the portrait on the right, a wider aperture of f/2 was used to fully blur the flowers. Using bokeh techniques can also work really well for hiding ugly backgrounds. When you are forced to shoot in a less than ideal environment, throwing your background out of focus with a shallow depth-of field can help. It not only hides any distractions, but the subject also "pops out" from the background much more. When creating bokeh portraits outdoors, it can also be fun to experiment by placing foliage between the subject and the camera. The extremely shallow depth-of-field results in a very dramatic bokeh effect as both foreground and background are blurred. In the example below, the camera was placed close to foliage in the foreground to create the blurring effect you see in front of the subject. Understanding light and using it effectively for portraits can be an intimidating subject but the best thing you can do to learn is to get started. The more you practice and experiment with different lighting conditions, the better you will become at natural light portraits.